The 370Z Nismo is already on sale in North America and Japan and now it’s coming here. Built to impress, the 3700Z Nismo is the second model in the range after the Juke Nismo and features a retuned engine from the boffins at Nismo (for non-petrolheads, Nismo is Nissan’s racing arm which produces some very impressive performance cars). This model has also been adapted to perform better on European roads with a re-engineered suspensions and chassis to help stability at higher speeds. The car features a 3.7litre V6 engine which has been returned by Nismo to give a 0-62mph time of only 5.2 seconds. This is only marginally faster than the ordinary model but this version packs more of a punch. Its’ also only available as a six speed manual coupe and there’s a raft of motoring improvements – all designed to help improve the aerodynamics. The 370Z Nismo’s front end features a more aggressive design improving airflow under the car, leading to improved stability at higher speeds and through corners. Other design enhancements include distinctive door mirrors, alloys, red-pained brake calipers and wider than usual tyres. There’s also a rear spoiler. The interior is quite impressive and driver-focused with fully electric sports seats and each model comes with a numbered Nismo plate. 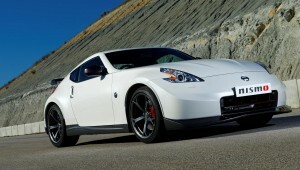 *I’m betting that the 370Z Nismo will be much cheaper to lease than buy! This entry was posted in Car Updates & Releases, Luxury Cars, New Cars, Sports Car and tagged 370Z Nismo, caption, car, coupe, Europe, Geneva Motor Show, Japan, Juke Nismo, LS, MoT, nismo, nissan, nissan 370z, nissan 370z nismo, North America, seat, speed, Sport, UK by Steve Lumley. Bookmark the permalink.